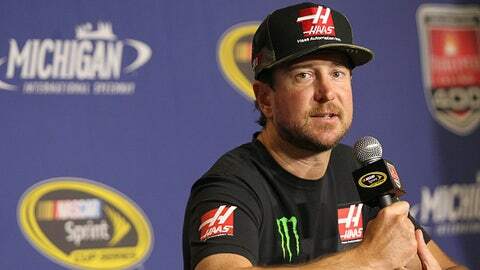 Kurt Busch drives for Stewart-Haas in the NASCAR Sprint Cup Series. Team co-owner Gene Haas also fields the Haas F1 Team in Formula One. Fresh off Monday’s victory at Pocono Raceway, it’s safe to say Kurt Busch is a wheelman’s wheelman. Busch has a NASCAR Sprint Cup Series championship to his credit and won rookie of the year honors in the 2014 Indianapolis 500, where he finished sixth in his first open-wheel race ever. He also has competed in the NHRA Pro Stock class and successfully tested an Australian V8 Supercar at the Circuit of the Americas. So what does a wheelman with a resume that diverse do on his off-weekend? 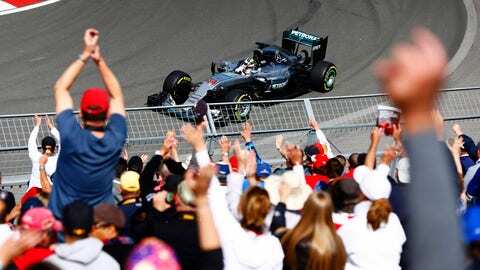 Head to Europe for a Formula One race with his boss, what else? The Sprint Cup Series is idle next week, but Busch won’t be. He is heading to Baku, Azerbaijan, to watch the Haas F1 team compete in the Grand Prix of Europe. And Friday at Michigan International Speedway, Busch seemed pretty geeked about his upcoming excellent adventure. “I can’t wait to hang out with (Romain) Grosjean and (Esteban) Gutierrez and have the opportunity to sit next to a Formula One driver and see his tools that he uses whether it’s simulation,” said Busch. Busch also has stated that he’d like to test a Formula One car.